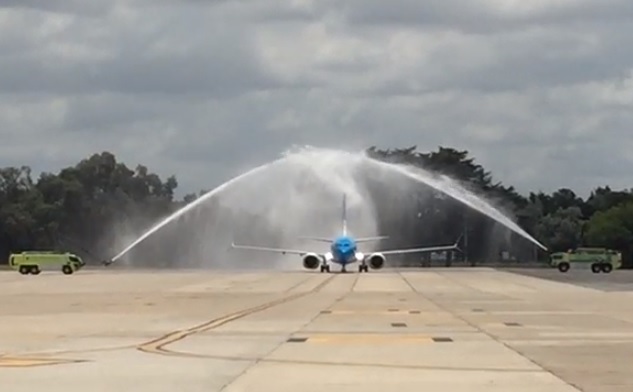 At the end of last year the first Boeing 737-Max powered by LEAP 1B engines was delivered to one of the customers – Aerolineas Argentina. EDC LEAP Fleet Engineer – Marek Galas was there as the EIS customer on-site support within the LEAP-1B expert connect project. The national carrier announced delivering of the new aircraft and our engines very widely in TV, radio and newspapers (full list of promotional activities is available here). One of the biggest attractions was the full-day trip of Boeing 737-Max from the north to the south of Argentina. Marek took part in this event together with the Minister of Transport, journalists and representatives of Boeing, GE/CFM (EDC PSE) and Aerolineas Argentina experts (engineers and mechanics). At the airports the plane was welcomed by local dignitaries, a brass band and water gates provided by fire brigades. The President of Argentina took part in one of the receptions of the new aircraft. For 2 weeks EDC PSE team was involved in CEOD data collections, daily checks and answering customer questions. Additionally, pilots opinions about engines were collected. They highly praised: silent work, low fuel consumption and, at the same time, the known quality of CFM56. “It was a pleasure to see that the effects of our everyday work are appreciated so much by the customers.” – said Marek, when he came back to Poland.